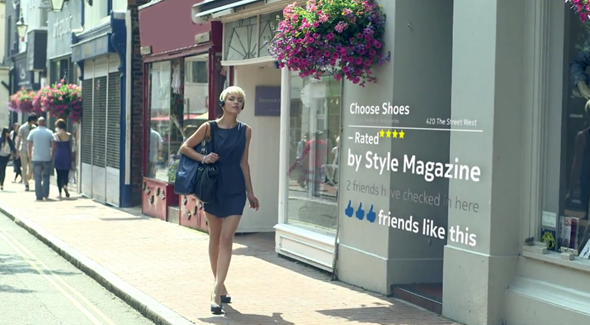 The first video shows a stylish lady walking down the street with an overlay on her left saying Choose Shoes – <address> by Style Magazine, the outlet’s rating and friends of the lady who have checked in there previously and “liked” it. The video then ends with “05.09.2012” which is, of course, the date for Nokia’s media event. In the second video (released shortly after the first), you can see the same lady mundanely choosing shoes while happy-happy music plays in the background. This is a very obvious hint at the inclusion of some sort of augmented reality tech which will let users point their smartphone’s camera to places around them so they can see contextual information on top. Nokia showcased (and publicly beta tested for a limited time) an experimental app called City Lens some time ago that offered the same features; so it’s safe to say that this will be making it’s way on to their next Lumia phone. Nokia’s next Lumia has already been outed, though. Yesterday, press shots and a very believable specs list was revealed: an 8-megapixel PureView camera, wireless (inductive) charging, 1GB of RAM and a 1.5GHz dual-core processor – all powered by Windows Phone 8. With ever-decreasing revenues and increasing losses, the Lumia 920 could possibly be Nokia’s last effort at regaining relevance in the cut throat smartphone market. They’ve put it all their faith in Microsoft’s Windows Phone platform which still hasn’t taken off to the level of iOS and Android, despite having such a lovely user interface, a strong operating system, and a large variety of apps to extend user experience. If Nokia does indeed come out with something compelling tomorrow, I may just consider jumping to the Windows Phone bandwagon. I was a big fan of Nokia’s phones before the emergence of the iPhone and powerful Android smartphones, but lost interest when they refused to leave the antiquated Symbian platform.